LIMITED AND NUMBERED EDITION: 25 COPIES FOR EACH PHOTOGRAPHY. - The images in origin have been captured in original slide Fuji Velvia 50 and Provia 100F or in digital file. - The original files have been processed by minimal adjustments of levels and selective mask of in Adobe Photoshop CS6 in a calibrated high resolution sreen (1920 x 1200). - The copies are realized in photographic professional paper Kodak Endura, who according to information of the manufacturer assures a longevity of up to 100 years in correct conditions of exhibition . - The copies are numbered and signed to the back by the author. - Every copy includes a certificate of genuineness. All the photographies prepared for will show only the image (no frame). Postage and handling not included. For any other size you´re interested, please ask the photographer across the section CONTACT os the web. In case you´re interested in purchase a copy in limited edition, you can buy it directly clicking theADD TO CART label that appears on each of the images. 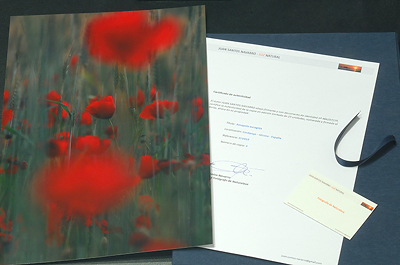 Also you can acquire copies of an selection of my images across PORTFOLIO NATURAL' s web, group of that I am member and part of its Board of directors, and on the website ELEMENTEM PHOTOGRAPHY. Due to the difference of calibrated of the different sreens, the image that you receive can show light tonal differences whom you visualizes at your screen.